Feeling a little bit scared about writing today. I made the mistake of reading some news before coming here this morning. So much hatred! Hatred of Israel, of jews. Jews being attacked in the streets of so-called civilized countries, and nobody cares, it’s not even reported. Jews who have lived peacefully in countries throughout the world, who have not attacked others because of religion, or for any reason, who have taken second-class citizenship, who have contributed to countries’ economies by working, paying taxes, by their research and invention, are being attacked by people who hate them just because they are Jews, and the world says nothing. Why are we (Jews) so scary? Why is it necessary to hate us, beat us, kill us, for being basically peaceful, and successful? I even read an article that attacked us for being so civilized, being ‘more Christian than the Christians.’ The person opined that we should just forget about the civilians and lay waste to the Gaza strip. Would doing that somehow make us more acceptable to the world at large? I also saw a political cartoon, in Hebrew, which showed the notebook of a child from the south returning to school. It said ‘what I did on my summer vacation’, and in the notebook were bits of shrapnel, a bullet from a Kalishnakov, and so on. We don’t return to school in my home. All of my kids (that I raised) have been homeschooled. In the U.S. and then in Israel. My youngest is still technically in school, he is just turning fifteen in October. The difference (for us) between homeschool and away-from-home school is that the learning never stops. What my youngest son learned wasn’t part of a vacation, it was education for life. In his life he knows that there are people who hate him, his family, his people, so much that they will indiscriminately kill anyone and anything in order to do him harm. He learned that there are people far and near, people who he knows and people he has never heard of, who care enough to take him into their homes and make him safe. He knows that wherever he goes there will be good and bad, and also good and evil. He missed out on playing soccer this summer (too dangerous to be outside), but learned a bit how to warm up and cool down when he goes for a run. He learned what it is to outgrow a friend, and that he can be happy, even if he lost every single game of a tournament. Just getting to play was enough. Listening to my iTunes music on shuffle, a song came on with a voice that sounded just like a distant loud-speaker for a tseva adom, and I just about jumped out of my skin. My heart was still pounding five minutes later when The Husband came in for something. I wonder how long such reactions will last? Days? Weeks? Years? When we first made aliyah (moved to Israel to live), we met a woman in Karmi’el who had lived through Israel’s first Lebanon war there. While she was visiting with us, our singing tea kettle rang, and she just about went through the roof. She explained that it sounded like the rocket sirens during the war. I didn’t really understand then, not like I do now. That was more than ten years after the 1st Lebanon war. So years is not only possible, it’s not that unlikely. How many permanent scars are there, and the war isn’t over yet. We have a ceasefire. Twice now we’ve acted as if a ceasefire is the end of the war. It isn’t. Even if we go forward with talks in a month, the war isn’t over until we Israelis can live our lives without fear of the continuous and unreasoning hatred that exists all around us. And so it goes. I need a bath, desperately. T.M.I.? Too bad. Life for a cripple means going without a lot of things, and sometimes personal hygiene is not up to a standard I might keep if I were not disabled with an invisible chronic illness. On a positive note, I got up and walked to the kitchen and did a bit of cleaning in there, for the first time in I have no idea how long. I hope it isn’t more than a year. The kitchen has only been ‘man cleaned’ for almost all of this time. You don’t want to know. I could only do a very little bit, and had to go back to bed, but I’m hoping it is a sign that I am coming into a more functional period. One of the joys of M.S. as I have it is I just never know when, or if, I will be able to do stuff (or what stuff I will be able to do). So today – knitting, driving, bathing. Catching up some more on this’n’that. Doing math with youngest son. Maybe learning a bit more Hebrew. My life still had good and happy things when the rockets were raining down, how much more of them should there be now? Just because sometimes you have to work a bit harder to find the good, doesn’t mean that it isn’t there and well worth the work. Well, it finally caught up to me I guess. The rockets stopped and I collapsed, or near enough. Yesterday I was at least up – I got a whole bunch of knitting done, balls of yarn wound, mapped out and started a new project. Nothing heavy or physical, but accomplished something. I didn’t have the energy to write much of anything, but I was awake. Today, not even that. I don’t know how long I’ve been asleep, I do know that for the while I was awake today all I could do was sit up and moan about not being able to do anything. And eat. I think I ate enough at lunch to feed another family. I’m only upright long enough to type this and hit the toilet, then with any luck I’m going back to sleep, or at least doing absolutely nothing. I suppose it had to happen, but I was too exhausted to see it coming. Have a quiet, restful day, and shabbot shalom from the northwestern corner of the Negev. I had a really bad night, and when the time came to get up to go to the amusement park today, I honesty questioned whether my going wouldn’t just be a huge drag on everyone. However I did pull myself together, with a lot of help from TH, and managed to get dressed and out to the car with a bag full of supplies for surviving the day. The most important of these was food, but a close second was my knitting and a book, for the time I expected to be parked somewhere while the guys had fun, and I just tried to stay as cool as possible. I guess I had some low expectations. It was a pretty wonderful day overall. I managed to get on a water ride which wasn’t very exciting at all, and really quite pleasant to get splashed and to smell air that was full of water spray. Those sort of things don’t happen in the summer in the desert here. The park was definitely more Israeli than American, and lacked the frantic feel of so many amusement parks I’ve been to in the States. We split up at the gate, the guys went off to do what they wanted to do, and The Husband and I wandered around, just finding things and getting a feel for the park. Once we’d done that and also managed to get onto the water ride, I picked a bit of artificial grass under a shade umbrella(tent?) by a pond which had swan boats. There were plenty of nice, quiet, shaded spots I could have sat in. I switched to a plastic chair and put my feet up on the seat of the wheelchair, and had a very pleasant time knitting, people-watching, chatting with various family-members as they wandered by, generally just enjoying being there. I even think that it would be worth it to pay the admission price just to sit there of an afternoon sometime. One way that I know that the ceasefire is for real is that there was no news. Absolutely no news. It’s kind of weird. The headline story on one news site is something two days old – there’s no war news and no one has anything else to report about. I’m sure in the next couple of days all the old bickering and politics and assorted silliness will once again take over the news pages, but for today, it was as if without the war no one could think of anything to say. We stopped in Sderot on the way home to pick up pizza. Pizza is our go-to party food. There was a moment there that I thought I heard the start of an alert. Just jumpy, I guess. Also, the reflexes are prepared to jump and run, and suddenly there is nothing to jump for or run from. I could have gone for a walk tonight for the first time in I don’t know how long without worrying about being too far from the house or the bomb shelter, but I was so very dead from the whole big day out that TH and I finished watching Saving Mr. Banks and now I’m writing this before (hopefully) going to sleep. The news sites aren’t the only one who are going to have to fill up some dead space now that the war has paused, or maybe even stopped. I’m not going to begin to try and guess that one. The fact that I can reasonably expect *not* to have rockets incoming tonight is enough to be getting on with. Youngest son even went to sleep in his own room. He says just for tonight and he’ll see how it goes. I am so glad we have a chance to get back to something resembling normal. Only on top of everything else fun we’ve been coping with, TH got a phone call from his work, that he must come in to the office tomorrow (Thursday is a day he always works from home) and he has meetings scheduled with the two biggest bosses. I guess I don’t have to worry too much about TH being fired – he’s pretty indispensable there. But I still worry about one more thing, challenge, change. I’d be just thrilled if everything could just stay stable and unchanging, even just for a little while. It is too much to have to deal with all these ‘normal life’ things on top of everything else. Oh, well. There is some hope that the latest round of hostilities has ended. I’ll believe it when days turn into weeks and nothing starts up again, but there is hope – a good thing. And my daughter-in-the-army was able to take tomorrow off so that I won’t have insufficient help while TH is off at the office instead of just in the next house. Now I just pray for a better and easier tomorrow. And for peace to spread out like ripples on a pond. It would be nice. I am honestly at a loss to write about the last twenty-four hours. After the pleasantly quiet day, we started getting the rockets in the early evening, very unpleasant. I think we were fortunate, I don’t remember any rocket alerts in the middle of the night. I suppose I could have slept through them. The Husband and I were taking a ‘date night.’ Generally we shut ourselves in my bedroom, play a rail game – a kind of board game involving ‘building’ track and running trains, delivering loads. We had a rocket as we were setting up, which worried me a bit. When the game is set up (on my bed) there is no getting me out of there in fifteen seconds. Fortunately the rockets held off for the game at least. Today I mostly knitted, I couldn’t really do much else. First was waiting for youngest daughter to come home from base, after which TH and I were to jump in the car and drive off to pick up youngest son from my brother’s home. Just as we were to start pulling things together and heading out the power went out. It wasn’t just us, at least one of our neighbours had also lost power. TH phoned the power company, who hadn’t heard about any power outage around here. It took a while to get things going after that, and to decide to leave the two kids in the house (not kids, grown ups, but they are *our* kids) to cope with the electric company when someone showed up. Just as well, TH and I left a bit later then we had wanted, also brought a dog along on the ride for fun. Picking up our son went without a hitch, and back home again to rockets, rockets and more rockets. We had just sat down to supper when the alert sounded. I brought my plate with me, it took us more than the allowed fifteen seconds to all get to the hallway with all the doors closed. Even with a bunch of practice, it is hard to just leave supper sitting on the table with the critters all circling to grab it as soon as our back are turned – or we are down the hall waiting for the bombs. Five minutes waiting for the all clear, and we are back in the salon just managing to eat a bit when the next barrage is announced. And so it went. Supper tonight was fish, which really isn’t best eaten cold after several alerts, but what can you do? We also had garlic bread, melon, broccoli. Despite much of being eaten cold, it was quite tasty. Maybe one’s tastebuds are more active when one has run for one’s life? I don’t know. I do know that when TH told us about the ceasefire – after another rocket attack, we were all variously skeptical, amused, doubtful. I’m not sure exactly when the ceasefire was supposed to actually have taken effect, so I don’t know if some of the rockets fired at us came after it started. I don’t suppose it really matters. Ceasefire or no ceasefire, we get rockets here. Sometimes more, sometimes less. After the last one (Operation Pillars of Smoke) it took weeks for the rocket fire to peter out after the cease fire. That’s why we joke: we cease, they fire. Whatever. It’s been quiet since then, at least in terms of the rockets. I haven’t heard the guns firing, another blessing. My thanks and prayers go out to the guys (and gals?) who man the Iron Dome batteries. I simply can’t imagine what it must be like, but I know it is hard, and gruelling, and they have gone so far beyond what should be demanded of anyone. We had an Iron Dome interception overhead, really close. D**n! those are LOUD! What with the cease fire being on, or off, or on, we don’t know if there will be a street fair in Sderot as was planned, or an outing for people from the south, which was also mentioned. WE – our family here which is oldest son, youngest son, TH and myself, are taking ourselves to Superland amusement park tomorrow. Our sole bit of ‘real’ vacation this summer. Assuming the rockets stay stopped. Expect me tomorrow exhausted, quite possibly sunburned, and with a bit of perspective after (hopefully) spending a few hours completely divorced from any of this. 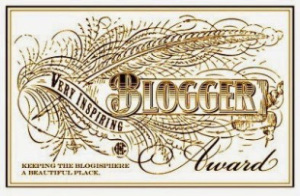 Many thanks to Adi for nominating me for the Very inspiring Blogger Award. I’m rather stunned, to be honest, that anyone thinks that highly of this blog or me. Not that I’m complaining… Adi is a lovely young woman (I hope she doesn’t mind me saying that) who I only met on WordPress a little bit ago. I think she is well worth getting to know. 1. I love to write. I write for myself, journal entries, diaries, short fiction, poetry, essays… few people get to see what I write, because I tend to burn it, or hide it away in dark places (like the attic). I’m trying to get over that. 2. I love the colour yellow. Nothing as tame or boring as lemon yellow or pastel yellow. I like a fiery yellow that brightens everything in reach. 3. Everything I’ve done in life, I’ve started without a clue – marriage, kids, moving to Israel, blogging. I don’t do research (much) or imagine how things will turn out – I just do it, and find out as I go. I suspect some things in my life might have turned out a bit better had I spent a little more time in preparation, but overall it’s working out just fine. 4. I am an enthusiastic and reasonably talented knitter. I’ve been knitting since I was maybe six years old (so long ago I can’t remember). I knit just about everything, although what I like most is knitting lace. I am about to finish a second pair of wool socks for myself (what I do during a war – socks are great) and am in the middle of two blankets, one for myself and one for my step-granddaughter in the U.S.
5. I love children. Babies, toddlers, pre-schoolers, school-children, pre-teens, teen-agers, and adult children. All are great. Mostly, though I want more babies. I love to hold babies. Babies are good for the soul. 7. I use homeopathy. I was converted when I was pregnant with my third baby. I’d had terribly, awfully, horrible morning-sickness all day with the first two, nothing helped, I couldn’t keep anything down. I don’t know how I gained enough weight to have the baby. Third pregnancy I was working with a lay-midwife in Massachusetts, who suggested I try the homeopathic remedy nux vomica. I was willing to try anything, and, barring a little bit of nausea just after I started taking the nux, I’ve never had morning sickness since. I branched out from there, and my kids various childhood bumps, bruises and illnesses were all treated homeopathically — sometimes in the teeth of doctor disapproval. I think it’s getting to me again. No, wait, that was yesterday. So I guess I’m just starting to recover a bit from this unbelievable weekend. I missed some of the very best of the bombing by driving youngest son to Beit Meier yesterday evening. The Husband drove, I rode along and I got to see my brother briefly. Then we turned around and came back home, without our youngest son who is going to be spending two bomb-free nights with my brother and has (hopefully) enjoyed his MtG tournament today. TH and I stopped in Beit Shemesh for some shawarma before driving home as quickly as possible. Don’t want to be away from home when we have two of our children there and the bombs are falling. Still, it was more than three hours by the time we got home, and we’d missed three tsevei adom and apparently one enormous ‘boom,’ from us in Gaza. I asked the kids about the big boom, but they didn’t even notice it really, despite it shaking the whole house. I guess we have become too familiar with these things. My youngest son didn’t sleep the night before, and ended up sleeping half the day away as a result. The rest of us, either from greater exhaustion or more practice sleeping through tense times are also having disturbed sleep, but we are at least able to sleep through whatever is going on. Today has been mercifully quiet. We’re getting plenty of loud noise from the guns, but no rockets aimed at us. Really, if it is a question of us shooting at them vs. them shooting at us, I sure sleep better if it is us shooting at them. I suspect I am starting to repeat myself. What else is there to say? It was suggested that TH should try to get me someplace out of rocket range where I can meet up with my driving teacher so that I can continue to move forward there. TH and I tried to think of someplace that isn’t such a long drive as to be impractical but that isn’t also being hammered by rockets. I think we concluded that Beit Kama might work for that. Have to talk to the driving instructor to find out if it is possible. The whole point of this – the driving lessons in order to get a wheelchair van – is that it is so difficult as to be virtually impossible to get me anywhere using a regular car. I can’t get in and out of one by myself, someone has to ‘transfer’ me to and from the wheelchair. The wheelchair has to be folded up and put in the trunk. 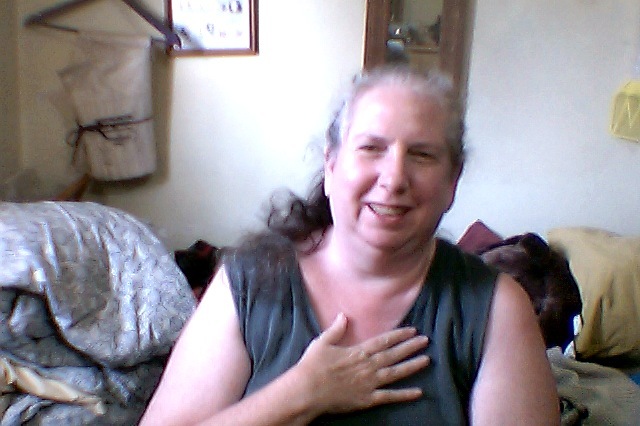 I have to wait at any stop for the wheelchair to be got out of the trunk and put back together before someone can transfer me to it, leaving me sitting in a hot car often in the sun – dangerous even if one isn’t a cripple with a disease that gets worse when one becomes overheated. And all of this is utterly exhausting. So I have to go through all of this, wearing myself out, and turning a one hour lesson into a half-a-day trek, in order to be able, someday, to leave the house by myself, or at least with way less effort than is required today. Thanks for that, too, Hamas. I’m afraid I simply haven’t anything exciting to say today. My cat, Kitten, has come in and is kneading on my lap making typing a bit more difficult. I’ve nothing I *have* to do today, laundry is caught up and I even think I got enough sleep last night, even if I could still use some more rest. TH and I (and daughter-in-the-army) watched the newest Doctor Who last night, staying up later than we should have. The dogs are chilling out, appreciating not having to run for cover (my short-legged black dog runs under my bed). It is really quiet in the house. Such a peaceful time, when in theory I could be gathering my thoughts and coming up with something really profound to write. I think that most of my problems are really ‘first world’ problems. Outside of little things like the war, and having our house sold out from under us, I’ve nothing to complain about. So I guess I’ll get back to work on the sock I’m knitting. Second of a pair of bright, variegated wool socks that will keep my feet toasty this winter. I hope. Update added an hour later: I hadn’t checked the news before I wrote this post. I now know that the rest of the country is not enjoying our quiet today. Rockets have been hammering the area, but for some reason our little moshav is seeing and hearing nothing of it. I’ve been thinking what to write. More little things, like getting a tseva adom (rocket alert) at the very end of an Alfred Hitchcock movie Friday so that we missed the ending. Had to wait until Saturday night to find out the ending. Big things, like the heart-breaking death of 4yo Daniel Treggerman. Sorry, can’t spell it from memory. Things like running for cover while oldest son was out getting the donkeys in the shed for the night. Older daughter ran to a window (dangerous/life-threatening) to call out to him to take cover, only what cover in the yard? The donkey shed has only a light tin roof. Still, better than nothing. We’ve had some bad news, it appears that the landlord has sold the house right out from under us. Better news, the new owner theoretically wants to continue renting to us. Is that good news? The house is a P.O.S., the only reason we’ve stayed here in a non-accessible house at the end of nowhere is because we had intended to buy the place ourselves, so why would we stay to rent from someone who doesn’t even know who we are? We started kicking around possibilities of alternative places to look for a home. TH says wryly that there are plenty of houses available in Eshkol. Heh, it is a community that is even closer to Gaza then we are. I’m not scared away by that, but I do think we need to cast a wide net, hoping to find someplace with a house that is big enough for all of us, at least marginally wheelchair accessible or able to be made so with minimal work and expense. Someplace with room for all of our critters, and neighbours who won’t object to same. Someplace that we can afford, and someplace that will not make our kids’ commute even harder than it is. It doesn’t seem very likely, not even sure it is possible. So what if there are a few more bombs headed our way, or we are in range of mortar fire – especially if the new home actually has a safe room? I’m a little bit bitter right now, don’t mind me. And in the middle of all of this, I’m trying to get youngest son to a Magic the Gathering tournament in Jerusalem, someplace in the city that I’ve never been, only heard of. *I* can’t take him, TH absolutely must go in to the office that day. My brother has offered to take him, but he doesn’t know where to go either. Can I get any help with this? It seems I can not. I’m doing my best. I’m sure there are more people I could ask, but at a certain point one just gets tired of asking for help. My driving lesson was cancelled for today because of all the bombs. I can’t get my van if I can’t get my license, I can’t get my license if I can’t learn to drive with a joystick. I can’t learn to drive if there is the chance of us getting blown up while driving around the moshav. I’m failing to be calm, cool and collected while writing this. I am failing to be unemotional. I’m overwhelmed, upset, frustrated… I go to facebook and I can’t take it very much. Whether it is more bad news here in Israel, or more media propaganda, I just can’t take it anymore. I’m crying, for the 4yo killed, for his mother who couldn’t save him, for us and our seriously f**ked up situation; crying out of frustration and, just, emotion. I am highly emotional. I don’t know why I feel I have to explain that being bombed can make one highly emotional. I’d think it would be self-evident. And – to top it all off, I got an earful of my mother’s insanity last night. No, that’s not really fair. But I was *reminded* of my mother’s insanity and it was linked to what is going on here, with Hamas bombing us and blaming us for it, blaming us for the deaths of all those children they put in harm’s way by launching rockets right next to them, or under them. See, mother blames me for everything. Doesn’t matter what it is or whether it has any relation to reality. I am the bad guy in her life-story. Just ask her. If one has any deep-seated traumas or unresolved issues, being bombed will bring it to the surface. If not immediately, then eventually. So it’s not all about what is happening here and now. There is a lifetime of emotions available to pile on to the current situation, making it feel bigger, worse, making me feel more trivial and more like I’m over-reacting. As I read from someone else today, on an entirely different topic, I’m not over-reacting, I’m reacting. Being bombed. Sometimes I can take it with a lick of humour and stern resolve, sometimes I’m a cowering mess of hysteria. Sometimes I’m just putting one foot in front of the other, grateful that at least I am living a life where I don’t have to make up elaborate fictions to explain away reality because reality is here, right here, and not going anywhere. I don’t have to be afraid of the person in the mirror. Sadly it seems that the people in Gaza also have no trouble looking in the mirror. Killing children, telling lies about it, deliberately putting innocents of their own people in mortal peril, doesn’t bother them. Many, perhaps most of them. It *is* cultural – but that doesn’t make it all right. I’d like to go into more detail, but I also don’t want to go there. It’s all there, read about their culture, stealing as a way of life, kidnapping is business as usual, blood-feuds, murder. Also hospitality, a sense of honour — but you are a fool if you think it means the same thing as most anglos mean by the word, loyalty… It is a different world, with different assumptions, and cannot be judged by outsiders who only see (at best) the surface that they present to the world. And if it is a clash of cultures, so be it. But seriously, does anyone really want to be championing a culture which sees death as the highest achievement, that believes that children are born to be sacrificed for their cause – whatever the cause might be. Is that a culture we want to be encouraging, supporting, carrying forward into the future? Okay, I am using reason again. I know this isn’t a situation where reason holds sway. I can’t help it. I was not raised to believe that it is okay to tell any lie to someone not of my faith (as muslims are). I was raised to believe that there is no cause greater than saving or preserving a life. I stand against people who do everything they can to increase the numbers of dead and wounded, and with anyone who will attempt to prevent the same. Simple. So simple. I find myself writing, in my head trying to reach a ‘friend’ of mine who expressed concerns about the ‘occupation,’ as if that makes any sense. As if that justifies the people killed and wounded, people herded onto the tops of buildings with weapons caches underneath, people who died, including children, building dozens of tunnels from Gaza into Israel. Oh, I can’t go there! You cannot reach people who do not want to be reached. People who, having made a decision, close their minds against any new information coming in. I’m rambling, lecturing, all the things I didn’t want to do in this blog, but the fact is that I am living with such stress that it can’t be imagined, believed or understood by outsiders, and I am trying in the midst of this to care for my children, to cope with the major life-changing stress of moving, and to be at least coherent, even if not glib and articulate.